BOG continues to support oil exploration and production companies to optimize their production processes. Recently, BOG delivered 2 twin screw pumps to the Shell Petroleum Development Company (SPDC) in Port Harcourt, Rivers State in January 2019. Pumps are used for Pumps are used for gasoline transfer, injection tasks, chemical transfer, steam stripping and a host of associated tasks in the oil and gas industry. The technical specifications of pumps vary based on the required task or application. Bournemann GmbH is a reputable German manufacturer of different types of pumps and provider of other oilfield solutions. It was founded in 1953 and is based in Obernkirchan, Germany. It is currently deploying technologies in the areas of triple-screw pumps and multiphase pumps, in addition to already established twin-screw pump technology. 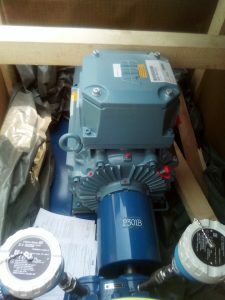 In delivering these pumps, BOG worked effectively with Creativ Pompe, the exclusive distributors to Bournemann, to ensure that the two twin screw pumps were manufactured to SPDC’s specification. Prior to the manufacture, a team from SPDC had carried out an inspection of the manufacturing process to ensure proper documentation and suitability of the pumps during installation. The pumps have been delivered and are currently being installed in Shell’s facility. The pumps have been delivered and are currently being installed in Shell’s facility. They will boost operational optimization for Shell, a further testimony to BOG’s commitment to our client’s operational effectiveness and overall success. 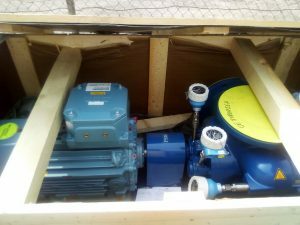 Above and Below: the pumps delivered to the Shell Petroleum Development Company (SPDC).